Cracks, corners or arêtes, many can be con- quered by a series of layback moves. Get it right and you can move quickly and ef ciently, get it wrong and you’ll have a strenuous off-balance nightmare. The basic principle is the rule of opposites, trying to use left hand against right foot and vice versa. Step onto a vertical wall with your left hand and left foot directly in line with one another and lean right, laying away from the holds. Now push off the wall with your right hand. What happens? Layback and barn dooring off! Step back on to the same holds using the rule of opposites. Face in the direction of the hand (so if using right hand and left foot face right) and lean away from your hand. Push yourself away from the wall with your left hand. What happens this time? Is it more or less stable than the using limbs from the same side of the body? Get back onto the wall, using the rule of opposites. With your foot ‘accelerate’ and ‘decelerate’ like you would in a car. Is there a point you can ‘decelerate’ to where you start to feel the ‘barn door effect’? Try to hold this position. Then ‘accelerate’ as hard as you can. Which felt easier to maintain balance? Try the exercise again. This time the ‘accelerator’ is a button under your big toe. See whether you can get the same effect just by pressing the button lightly. Find a corner, arête or flake and link some laybacking movements together, concentrating on keeping your arms straight. Then add the rule of opposites, does this help you stay in balance? Then ascend without crossing your hands over. Always lead with the same hand, keeping the outside shoulder lower than the inside one. 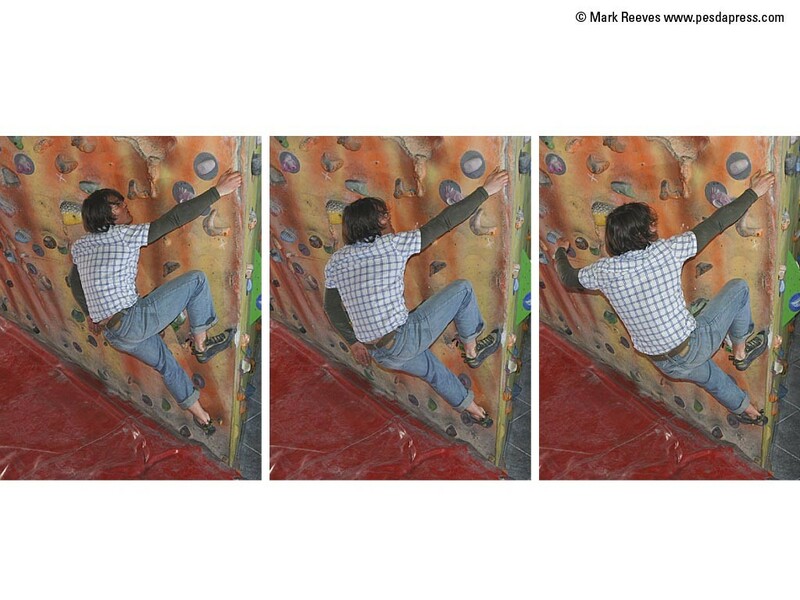 Try again, this time crossing hand over hand, as you layback up the feature. Is this easier or harder than leading with the same hand? Which feels more in balance? As you acquire skill and shoulder strength, it will become easier to cross hand over hand. Think about your feet. Layback up a feature three times, on the rst go keep your feet really low, the second go bring them really high, and the third go somewhere in between. Which feels easier? To layback ef ciently the trick is to know when to transfer the weight from one set of limbs to the next. Concentrate on keeping your arms straight, pivoting around the hands and shoulders, using your feet to drive you up. Between movements try and develop opposite limbs taking the strain. If it is a short section of laybacking try and climb it as quickly as possible to a rest. Many arêtes will succumb to a series of laybacks. To climb them well requires kinaesthetic aware- ness of the various positions of rest open to you. The change of angle around an arête can be ad- vantageous, if our feet are on one side laying away from the arête even a small hand hold on the other side can become a jug. Layback up an arête, using the rule of opposites. You may need to move from one side of the arête to the other as hand and footholds dictate. Try moving around the arête from one side to the other. Recall the hands-off rests video. Climb an arête and with as many hands-off rests as possible. Lay backing up an arete can be delicate and strenuous all at the same time. Find as many rests as you can. Pivot around your hands by driving from the feet. 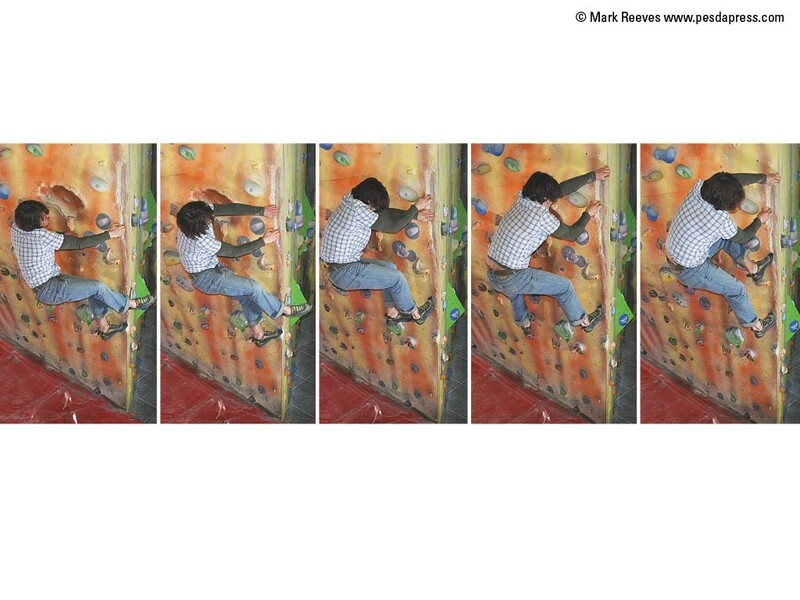 Practise moving around arêtes from left to right. Most of time you will climb facing towards the arête.